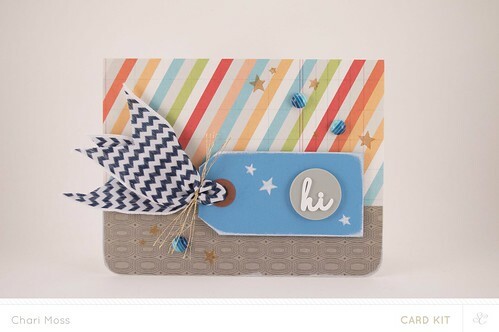 Today I have another card to share using the Studio Calico Copper Mountain January card kit. 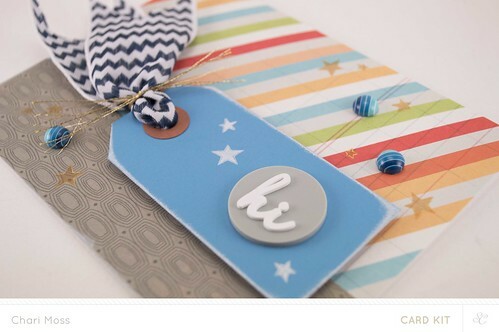 This kit comes with a blue tag, some very wide zig zag ribbon and two cool rubber "hi" embellishments. All items I don't typically find myself using on cards but that's the challenge right? So I really did challenge myself to use these items and I was super happy with they way this card turned out. I used white ink to distress the edges of the rage to help tie it in with the white of the "hi" embellishment. I also stamped some white stars on the tag as well. 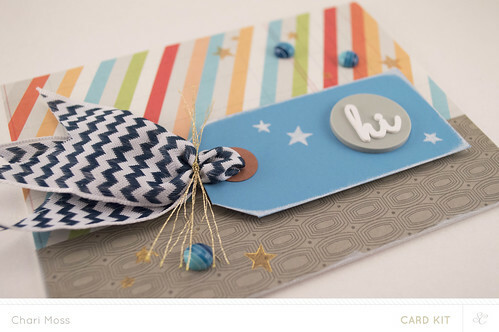 The wide ribbon holds it's shape well so it is great for use on a card like this. I stamped the stars in gold on the pattern paper to match the gold floss. I can't wait to start seeing what others make with this kit as they start to arrive on your doorsteps. Thanks for stopping by today! I'm headed to CHA soon and look forward to sharing pics and tweets from there in the coming week.